HANOI (14 Dec 2018) – Vietnam head coach Park Hang-seo has a simple advise for his chargers ahead of tomorrow night’s second leg finals of the AFF Suzuki Cup 2018 and that is for his players to keep calm. Given the huge interest for the final game this year at the My Dinh National Stadium where tickets have been sold out for days, Hang-seo said that it is important for the team to keep things in perspective. 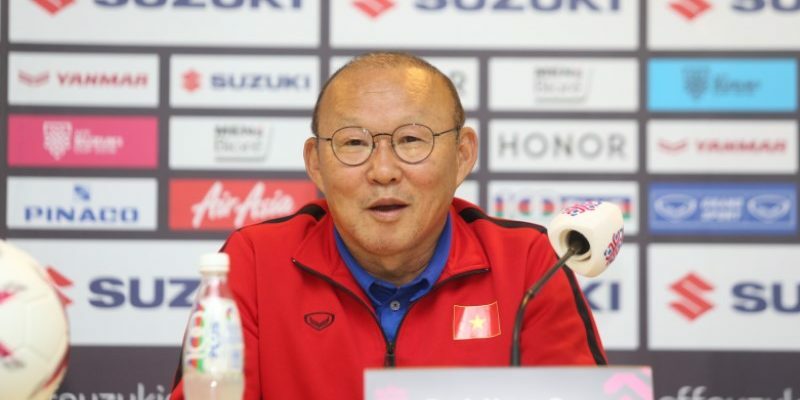 “It is a very important match tomorrow and while we need to give the fans and the Vietnam people a reason to celebrate, still I want the players to keep calm and not give in to pressure,” said Hang-seo. “We played very well in Kuala Lumpur (for the first leg finals) and that was due to the excellent support from the fans. So in Hanoi, I hope that the fans will show the same kind of support. Vietnam will go into the game on the advantage considering that they had a 2-2 draw against Malaysia to count on. All they need is a draw game and they can lift their second title of the AFF Suzuki Cup to add to the one they won in 2008. It has been ten long years since Vietnam last lifted the crown and the populace are eager for another night of celebration through the chilly streets of Hanoi. “I believe that we can win the final against Malaysia tomorrow,” quipped Hang-seo.